This past Monday my cohort and I presented at our GRS Expo. We shared as a cohort our journey this past year in GRS towards becoming teachers, as well as our individual commitments to reform based science teaching. There was one commitment I want to make but did realized I didn’t have time to discuss at expo that I want to talk about now. Something I want to do in my physics teaching practice is for my students to develop the physics equations we use through investigation and analysis, rather than me supplying them. The center of mass of a body or system is the weighted average location of all the mass. You can think of the center of mass as the point at which all the mass can be considered “concentrated”. For humans standing straight up, that’s somewhere around our lower torso. Let’s look at some qualitative examples before diving into this equation. If you want to experience this relationship yourself, stand with your back directly against a wall and drop a coin in front of you. Keeping your lower half firmly against the wall, try to bend over and pick up the coin. Most people won’t be able to bend over without falling. Now if you try to do the same thing without the wall, it shouldn’t pose too much difficulty. When your back is against the wall and you bend over, your center of mass moves forwards over the pivot point (your feet), so you become off balance. When the wall is removed, your body balances out this forward shift by moving your lower torso out behind you, so your center of mass remains above the pivot point. Anyways, back to developing our center of mass equation. We can see in our equation we have four variables: the mass of each object (m1 and m2), and the position of each object (x1 and x2) relative to some starting point. So we know that in our investigation we’re going to need to be able to adjust these four factors. As you can see it’s very easy to find the center of mass of a meter stick, with our starting point being the 0 end of the stick. Now lets say I attach a binder clips to any part of my meter stick and hang a mass from it. 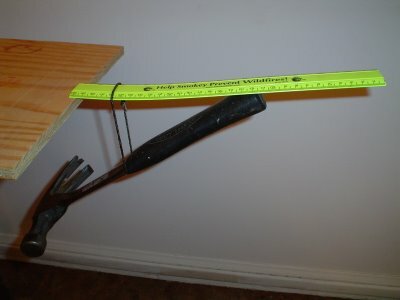 The center of mass will no longer be at the 50 cm mark, but we could find it just as easily as we did before. I could add another clip and another mass and voila, we have two objects for which we can adjust both their mass and positions with ease (the meter stick also makes it very easy to calculate their positions). It would be very easy for us now to test our center of mass equation and see if it held true and call it a day, but recall that the point of our investigation is to create the equation. This equation is looking nicer. While the relationship between the position of the center of mass and the mass of our two objects is still complicated, we do have a linear relationship between the position of the center of mass and the position of m1 (bonus points: the y intercept is 0). Everyone loves a linear relationship! It’s not too difficult to determine an equation for a linear relationship from a graph by finding the slope of the line (a process we would have practiced earlier in the year, perhaps when determining F = ma). For this equation, the slope would end up being m1 / (m1 + m2). Our initial challenge for our students can then be something along the lines of “what is the mathematical relationship between the location of the center of mass and the position of m1 for the given setup” (the setup being the meter stick + binder clips). I would give each team the same mass for m2, but a different m1. The reason for this will be come apparent in a second. Once each team has determined the relationship for their masses, they can then pool their findings together. One way to do this would be for each team to add their best fit line and equation to a graph on the Smartboard. In this made up example data, m2 = 1 g.
The inference we made to arrive at this final equation was perhaps a bit of a stretch, so maybe we should do one more value for m2 just to be safe. We can first predict what we should find if our equation is correct: slopes of 2/5, 3/6, 4/7, and 5/8, and then check if it works out in reality (spoiler: it does). Bonus investigation: What happens to my equation when I add a 3rd mass? This investigation would actually end with formulating the original center of mass equation, before any of our simplifications. There isn’t much opportunity for students to really lead this investigation. The setup and overall procedure is predetermined. I left the process by which students actually come up with their equations (what data they take, how they take it, how much they take) open, but in the end they need to come up with the linear equation so that when we combine our findings we can see the pattern. I’m worried about this experience being hands on without minds on. What will the students get out of doing this? My goal in determining these equations through investigation is for students to have a context what the equation is representing. In my placement I found my students understood if you push on something with a greater force it will accelerate faster, and that something with more mass won’t accelerate as fast as something with less mass, but they did not understand that F = ma represented that very same concept. Will building up the equation themselves help students’ conceptual understanding of an equation? I realize I gave the bare overview of the process we would use to come up with this equation and didn’t talk much about how I would scaffold the whole thing, but I’m curious as to anyone’s thoughts on these issues. For those of you who couldn’t make our Topics In Teaching class this week, we started thinking about our portfolios and how we could use what we did in Topics to help out with our portfolio narratives. To do that we looked at the ten guiding principles for the narrative and determined which sections of Topics could be used to help address those categories. Today I’m sharing the general overview of each principle and the Topics sessions that I think could be useful for that principle. I’ve marked the sessions that were blogable for Topics (class blog, not the GRS blog) as those blogs could make useful artifacts for the portfolio. If there’s a session I did not include for a principle that you think fits it, feel free to chime in in the comments. 1. Content Principle: The teacher candidate understands the central concepts, tools of inquiry, and structures of the discipline(s) he or she teaches, as identified by relevant professional organizations, and can create learning experiences that make these aspects of subject matter meaningful for all students. It’s a little awkward starting with this one, since the general feel in class was that due to the content specific nature of this principle it wasn’t something really covered in Topics. 2. Learning Principle: The teacher candidate understands how all children learn and develop, and can provide learning opportunities that support their intellectual, social and personal development. The teacher candidate understands that learning involves active engagement in culturally valued activities with knowledgable others and the construction of new knowledge. 3. Equity Principle: The teacher candidate understands how students differ in their approaches to learning and creates instructional opportunities that are adapted to diverse learners. The teacher candidate understands the role each of us plays in the maintenance and transformation of social and educational practices that engender inequity and is committed to promote equity and social justice. 4. Pedagogy Principle: The teacher candidate understands the link between content and pedagogy. As such, the teacher candidate understands and uses a variety of instructional strategies to encourage all students’ development of critical thinking, problem solving, and performance skills that are appropriate for specific topics and subject areas, as identified by the relevant professional organization(s). The teacher candidate is able to use and problematize the various technologies available to facilitate learning. 5. Learning Community Principle: The teacher candidate uses an understanding of individual and group motivation and behavior to create a learning environment that encourages positive social interaction, active engagement in learning, and self-motivation for all students. 6. Communication Principle: The teacher candidate understands the key role played by language in teaching and learning. The teacher candidate uses knowledge of effective verbal, nonverbal, and media communication techniques to foster active inquiry, collaboration, and supportive interaction in the classroom. 7. Planning Principle: the teacher candidate plans instruction based upon knowledge of subject matter, students, the community, and curriculum goals. 8. Assessment Principle: the teacher candidate understands and uses formal and informal assessment strategies to evaluate and ensure the continual intellectual, social and physical development of all learners and to inform instruction. Assessment is embedded in authentic learning activities that are for real audiences and real purposes. 9. Professional Practice Principle: the teacher candidate is a reflective practitioner who continually evaluates the effects of his/her choices and actions on others (students, parents, and other professionals in the learning community) and who actively seeks out opportunities to grow professionally, including staying up to date with research, theories, and best practices in his/her field and participating in their professional communities. 10. Community Principle: the teacher candidate fosters relationships with school colleagues, parents/caregivers, and agencies in the larger community to support students’ learning and well-being. We explored this phenomenon through the predict, observe, explain model. Michael initially presented us with the materials (a beaker full of a colorless liquid and a dish with some sort of crystal/powder in it) and had us predict what would happen if the liquid was poured into the dish. Then he demonstrated (creating an sculpture like the one shown above) and we recorded our observations. Finally, our cohort co-constructed an explanation for why this phenomenon occurred. (I should mention, before we did our POE, Michael presented us with sodium acetate hand warmers (make your own here!) to spark our interest and give a real world context for the phenomenon). Inquiry starters are just the beginning. We came up with a lot of investigable questions over the course of our discussion. These questions could then be used as a vehicle for learners to carry out their own focused investigations in which they explore concepts such as saturation. This week I’m wrapping up our unit on ecology. One of my favorite parts about this unit is all the cool videos I get to tie in. So much so that I want to share some of them with all of you! What happens to the energy held in an organism’s body when it dies? This first video shows a time lapse of the decomposition of a rabbit. Why do we need decomposers? In this time lapse, new life springs from the decomposed remains of a bowl of fruits and vegetables. My students were all very surprised when the (potato?) stalk started growing out of the bowl. Eagles don’t just eat one other organism. How can we combine the two food chains in these videos to show two ways the eagle is getting its energy? Same deal as with the eagle in these two lion videos. I ended up not showing these ones since I felt the elephant takedown was a little too brutal. Not sure exactly what a food chain is depicting? Wonder no more! The other day I was brainstorming with Jessica ways for students to experience Natural Selection. We wanted to do something that involved the random nature of evolution, as a common misconception is that evolution is a guided process species undergo to better succeed in their current environment. We came up with a general outline for an activity that can perhaps be further refined in the comments of this blog post! -Plastic spoons (of two sizes), plastic forks, plastic bowls, and plastic cups. One of each per student. -A whole lot of goldfish (the snack). The general overview of the activity is that students will take on the role of a hypothetical organism and its progeny as they go through the process of natural selection over a series of generations (rounds). The goal of the organisms in each generation is the same, accumulate enough natural resources to survive and have offspring. These natural resources will be represented by a bowl of goldfish. The students will also begin the game with a plastic cup and a spoon. Each generation (round) will take place over a short period of time (~10 seconds, needs testing) during which the students need to collect as many goldfish as they can from the bowl and place it their plastic cup, using only their plastic spoon. The cup has two levels on it. If an organism (read: student) does not fill their cup up to the first level, they do not succeed on to the next generation. If an organism fills their cup up to the second level, they have flourished in their environment and may add one point to the class’s score for the activity, or bring back a fellow classmate whose organism did not make it. On a 1: the student’s spoon is replaced by a fork. On a 3: The students utensil is replaced by a utensil of a different color. On a 6: The students spoon is replaced by a bigger spoon. On a 2, 4, 5: The student keeps their current spoon. Note: If a student brings back another student by reaching level 2 in their cup, the student they bring back returns with the same type of utensil used by their savior. Note 2: You will have to alter these categories slightly for students who currently have a fork or a big spoon. As the students go through many generations, they or the instructor should keep track of how many organisms of each type there are that survive in each generation to be analyzed after the lab. With enough generations (and assuming you keep the round time short enough to be challenging for those without big spoons) you should see a convergence towards organisms with big spoons. Boom. Survival of the Fittest. The next step if you want to extend the activity further would be to change the environment and the available resources. Maybe split your students into two separate “islands”, one which has goldfish, the other which has some sort of small object that is easier to pick up with a fork than a spoon (Spaghetti? ideas please!). After running the activity, hopefully one island ends up with mostly big spoons and the other with mostly forks. You could also be mean and switch the students’ resources after most of them have big spoons to something for which a fork would really be nice. Ideas? Questions? Comments? Clarifications? Potential misunderstandings (either by me or that the students may have)? There are a lot of details to be ironed out here. Also I’m sure there are activities people have done before that are similar to this and I’d love to here about those. As part of my book talk presentation in class this past week I asked fellow cohort members and supervisors to generate their own mysteries, magics, and myths based off the ones found in John W. Jewett’s The World of Physics: Mysteries, Magic, & Myth (check out my book review in a previous post). I hope some of these ideas make it into their innovative units! Here’s what they came up with along with some of my comments. Mysteries: Questions about everyday life that can be answered with the application of science. Why is it so cold in Rochester? -The question on everyone’s minds this time of year. Great question to get students to start thinking about the weather. -There are so many breeds of dog, how can they all be so different and yet all be dogs? Genetics has the key. Why do we only find gold/diamonds in certain areas? -A student brought a similar question up in my CT’s earth science unit, “why are diamonds so expensive?” I think it could be cool to also get into a discussion on synthetic diamonds vs. natural diamonds. How do minerals become glass? Why does everything need the sun’s energy? How are some birds older than dinosaurs? Magics: Demonstrations and other visual activities that engage student interest in the topic. Magnetite picking up a nail. Boiling water without adding heat. Myths: Ideas or seemingly statements of fact that are not actually true. A fish out of water will evolve to breathe. Changes are either good or bad (in terms of evolution). – Evolution as basically an exercise in statistics can be a difficult concept to understand. I was talking with Jess and Jo Ann the other day about creating an inquiry based experience on this concept. I somehow turned it into a survival of the fittest figurative death-match between students based on who was lucky enough to roll beneficial qualities on their dice. There is an unlimited number of natural resources for us to use. Living things don’t need rocks to live. It is easy to accurately predict the weather. -We weren’t actually sure if this was a myth or not, turns out there’s actually been some in depth research on the subject. For this week I thought I’d share a book review I wrote for John W. Jewett’s The World of Physics: Mysteries, Magic, & Myth. It was a fun read that gave me a lot of ideas and materials to use in future physics courses! Jewett explores the introductory concepts of physics through the lens of mysteries, magic, and myth. Mysteries “are questions about everyday life that can be understood by means of applications of the principles of physics… each of the mysteries can be “solved” with an appropriate understanding and application of physical principles” (ix). An example of a mystery is what causes a rainbow? Magic involves activities that present “discrepant events, in that the outcome is different than what one might expect,” such as the classic releasing a bowling ball pendulum from right in front of your nose (ix). Myths are common misconceptions that are usually taken as fact, such as there is no force of gravity in the international space station. Each new set of physics concepts is first introduced by its associated three M’s. This is followed by a conceptual overview, and then an explanation of each of the situations described in the M’s for that chapter. The purpose behind this structure is to create a context for the reader to think about and apply the concepts discussed. The reader is first introduced to the M’s, while doing so they are encouraged to draw on their own prior knowledge to reason out what is happening. The concepts are then discussed, but not in the context of the M’s. This gives the reader the opportunity to apply these concepts in order to explain the phenomena laid out by the Ms on their own. The following in depth discussion of each situation allows the reader to check and deepen their understanding of each phenomenon in relation to the concepts of the chapter. The content is on the whole light on mathematics, but some of the explanations do require its use. This book highlights the role of science as a method for creating a logical explanation for how the world works. In using the M’s as a groundwork for each concept, it keeps the focus on the application of theory to explain what we see, and not just on the theory itself. The mysteries and magic given are great examples for students to use as a relatable basis for exploring the concepts associated with them. Some of the mysteries could serve as guiding questions for a unit, or as challenges for students to apply their new understandings to. For example, “why shouldn’t you lock your breaks when sliding on ice” could be a guiding question for exploring frictional forces. The magic acts in particular I feel are great to use in a predict, observe, explain format, where the students explanations can change over time as their understanding of the concepts progress. These include classic demonstrations such as pulling a tablecloth from under a set of dishes and letting go of a bowling ball pendulum from right in front of your nose, as well as one’s I had never heard of before, such as inflating a balloon inside a plastic bottle. Carefully chosen myths provide opportunities to check for understanding by having students evaluate the myths’ truthfulness (myth: astronauts in an orbiting space shuttle are weightless). I loved the concept and the structure of this book. I think its a great supplement to the more traditional math based approaches. For many of the myths however, I felt the author struggled a bit with the implementation of the myths, many of them felt contrived, being based around a technicality in a definition, or requiring knowledge the reader would not have known (such as 110 V being a measurement of the rms voltage and not the peak voltage of a household outlet). Due to the focus on concepts, I think this is a great book for physics educators at any level (though some chapters may be beyond the curricula of a middle or high school course). It also seems like it would be a great starting point for anyone interested in beginning a serious study of physics, as the author gives many recommendations for further in depth reading that they could branch out to. First off, check out Jill’s last blog post on the issues-based science approach we’ll be collaborating on for our genetics unit. This coming week I’ll be finishing up our unit on the atmosphere and weather. For their final assessment the students will be creating their own weather reports based on a weather map of the US. I’m working on creating the maps based on the local weather for the week, and hopefully we’ll be able to film their reports. For those of you who might be doing weather later, I thought I’d share some cool experiences I included in my lessons. If you have some sort of vacuum pump, there’s a lot of cool things you can do that we couldn’t. Going further with the same idea of air pressure, my CT suggested an activity done by a member of the previous cohort who student taught with her last year. Thus was born the story of the aMazing Mountaineer Mark and his life-long pal Balloon Orlando, or Balloondo for short. The basic gist of the story is, Mark takes Balloondo up a mountain, and as he gets higher and higher (and as I climbed from floor to chair to desk) Balloondo’s head starts to swell up. The purpose of this story is to demonstrate the inverse relationship between air pressure and altitude. Some students also related this relationship to the increase in water pressure with ocean depth. Moving on to weather, we created a cloud in a bottle to demonstrate the difference in weather conditions between regions with high pressure and regions with low pressure. Here it is in action. A lot of people use a pump to get a really high pressure inside their bottle, but you can do it just fine without one. I only had two bottles when I did this experiment, I wish I had had enough for pairs of students to make their own bottle. Tiarra recommends 10 mL of hot water and one lit match in your two liter bottle for best effect. Make sure you shake the bottle thoroughly. I got some funny looks from students when I was setting this one up, but the looks on their faces when I stopped squeezing the bottle were priceless. Coming up this week for our discussion of fronts we’ll be using front tanks to look at what happens when cold and warm air masses meet. Hopefully it will turn out as well as this one does! This past week I moved from observing at my new placement to taking an active role in teaching. Wooh. My new placement is very different from my first one (going from a charter all boys high school to a public middle school), but many things carry over. One concept that I focused on improving in my previous placement was creating lessons that laser focused on one idea. When I started creating my own plans at my first placement I would tend to have multiple new concepts I wanted to teach in one lesson. This lack of focus on one idea at a time tended to create some confusion for students and created a disjointed lesson. I didn’t give students enough of an opportunity to build a strong foundation with each concept before attempting to combine them. After a few post lesson reflection facepalms on my part I got better at narrowing my focus. I felt my best lesson was the last one I taught at the end of my placement, and I attribute that success to concentrating in depth on one idea. Going forward into my new placement, where the periods are about 60% as long it’s going to be very important for me to keep this strategy in mind. Another concept that was heavily emphasized by the school wide lesson structure at my first placement was student reflection time in each lesson. Every lesson ended with students writing a response to a reflection question that required them to discuss the ideas of the lesson in their own words. This reflection gives students time to internalize new concepts while they are still fresh, as well as provides an informal assessment for the teacher to gauge students’ current understandings. At my new placement my CT has a similar reflection at the end of class, and though I always feel pressed for time in my lessons (Even when I had 70 minutes I always wanted more time…) setting out that time for student reflection is of tantamount importance that I want to continue doing. I do miss helping out during math lessons. Mathematics is the language of Physics as they say. I’ve been thinking about the feasibility of creating a math/physics hybrid series of courses… I think it can be difficult a lot of the time for students to contextualize high school math, and Physics provides many practical applications. I’ll probably blog more about it in the future after I’ve ruminated on the idea some more. 1) Get enough sleep. My new placement starts an hour earlier than my old one. I’ve been struggling to get to bed earlier this past week, hopefully I can get in a groove soon or I might have to take up coffee. 2) Get everything I need for the next day ready the night before. By that I mean set my clothes out, pack my lunch, fill a water bottle, and pack up my bag. That way I only have to worry about the bus in the morning, and I’ll have more energy throughout the day. This may set me back slightly on goal #1. 3) Be decisive with classroom management. During my first placement I was hesitant to address small disruptions in my class. This of course lead to me having to address larger disruptions when my students felt they had additional leeway for goofing off. I improved in my last couple weeks, but it’s definitely something I need to work on and I want to start off strong. 4) Look at my lessons from the students’ perspective. I’ve been doing science for awhile now, I need to remember my students have not. Some of my previous lessons were tripped up a bit since I assumed students had had certain experiences beforehand. This may be one of those things that is learned with experience, but making it an explicit focus will hopefully help me improve. 6) Relax. I get a little tense while I’m teaching. I’m always worried about doing everything perfectly during a lesson. I need to start trusting in the plan I have created and just go with it.